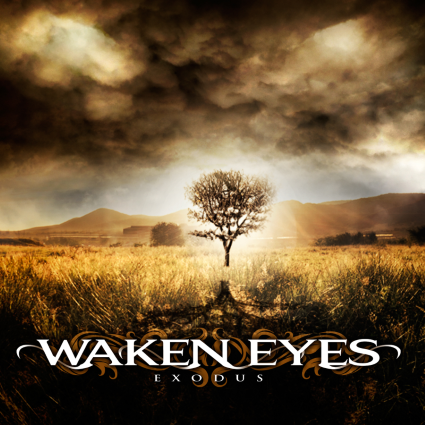 People have called Waken Eyes a “supergroup” or “all-star band.” There’s no denying the talent enlisted for “Exodus” but this is not a band at all. Guitarist, keyboardist and songwriter Tom Frelek is Waken Eyes. He hand picked Marco Minnemann of the Aristocrats, Michael Lepond of Symphony X and Henrik Bath of Darkwater to all play on this album. All 3 are stellar choices of course. But it isn’t a band and it doesn’t sound like one to me. The songs are very solid, the arrangements are tight and the playing is inspired. If I didn’t know it was Marco Minnemann on drums, there would be no telling from the parts he plays. I don’t hear anything where he adds to what was probably mapped out for him by Frelek. Lepond has very distinct but he is back in the mix on “Exodus.” Basically, the album belongs to singer Henrik Bath, who can definitely sing and Frelek. When I heard who was playing on this, I really expected something spectacular. Instead, it’s pretty much prog metal by numbers here. No real surprises. This is probably what Minnemann would have sounded like had he gotten the Dream Theater gig. Much of this is rather cliche at times. No moments where, I stopped to go “oh wow, what was that?” I assumed this album would be brimming with that. But it’s not a band. I think if this was a true collaboration, it would sound more interesting and less by the book. Obviously with this band, the sky was really the limit and there are moments were you think something might happen but it doesn’t. Check the end of “Cornerstone Away.” That ending is great! The problem is everything before it is AOR metal snoozefest. This is a case of the sum not being greater than the parts. I suppose if you call it a band, it sells more than calling it Tom Frelek and friends. Waken Eyes could have been something amazing and maybe if they get another chance, it will be just that. For now, “Exodus” just makes me wonder what could have been.